Below is a list of all the splash pads around the state. If you know of one we have missed, please email us at contact@enjoyutah.org. NEWLY ADDED: View the map of Splash Pads at the bottom of this post! Per a reader's request, we have added $$ next to those that cost money. Because this can change, please verify before heading out that the ones without $$ are free. 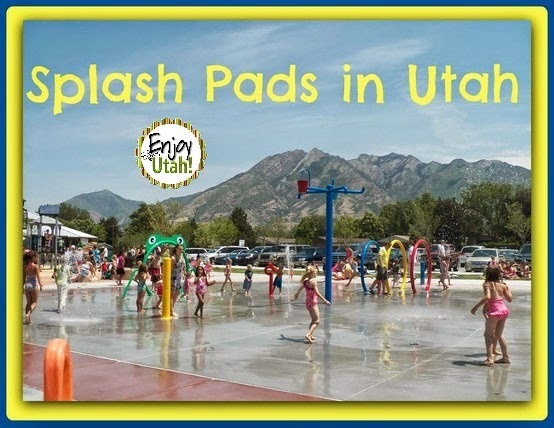 Enjoy Utah is not responsible for changes made by the splash pads that we are not aware of. What is a "Splash Pad"? A splash pad is a great place to cool off in the summer. Instead of a pool, it's more like running through the sprinklers. No need for floatees or lifejackets! We received a FABULOUS idea from one of our readers, Lacey. On our map of Splash Pads, we want to have a picture included for each Splash Pad! WE NEED YOUR HELP! If you go to a Splash Pad, please snap and send a picture to add to our listing. You can email it to contact@enjoyutah.org. Please include the name and location of the Splash Pad you are sending a picture of. THANKS FOR YOUR HELP! You will see "PHOTO NEEDED" next to the Splash Pads we don't yet have a picture for. Due to low water levels in Utah last year 2013, some splash pads were not running the water during times that are normally posted as open. Please click on the Splash Pad you plan on visiting, and make sure their water will be on when you plan to visit. We are not sure if they are going to be doing the same in 2014, but it's something to be aware of. UTAH DIXIE DEALS has broken down the list of Splash Pads in Washington County. Check them out on the Dixie Dollar Deals website. Click on the marker and it will show you a picture of that splash pad (if available). Click on the picture to enlarge. Eagle Mountain has one too! Providence in cache valley has one too! Off main street in Providence, just north of the post office! My friends say there is one in Lindon but I don't know where exactly. One block south of 12600, on 4570. One block south of 12600, on 4570 West. Washington County Splash Pads are essential down here-and many parks have added them recently. (there may be more but these are the ones I know of). Saint George Town Square, on Main Street at Tabernacle. (This has a large fountain splash pad, but our favorite part is the "river" and waterfalls). The Fields, on the southeast side at 2995 South 2350 East, St. George. UNITY Park in Ivins, at 200 West and 400 South. The splash pad is on the west side. The Community Center in Hurricane 63 South 100 W.
Archie H. Gubler Park, 2375 Rachel Drive in Santa Clara. Sienna Hills Park, 500 N Redstone Rd in Washington City. Green Spring Park, Approx 1775 N Green Spring Drive, Washington City. Pine View Park 2050 S Alveo Drive, Washington City. The Washington City Community Center 350 N Community Center Drive, Washington, UT. This one has a huge indoor splash pad, as well as pools and other features. There is an entrance fee. It is open year round. There was a fun one in Roy, UT (Davis or Weber county) it's been a couple of years, but I'm sure it's still there. Harrisville Park is opening one at the end of this month. There is one at Valley Fair Mall in West Valley. There is a splash pad in Cedar City right outside the Heritage Center. It's small and not on all the time, but there. In Cedar City there is also a splash pad right outside the Heritage Center on 100 W. It's small and not always on, but it is there. The one in Spanish Fork is at North Park 800 N 300 E.
There's also a new one in Harrisville, Utah that just opened 5/26/2012! In St. George there is one at Hidden Valley Park as well. Michelle - I heard that there is one in Murray but I am not sure where....have you heard anything about it or do you know where it is?? Willow Pond park in Murray? Is the water irrigation or is it city water? the link to the herriman doesn't work anymore. fyi Thanks for posting this information! There is a splash pad in Uintah County too. It is located in Vernal (Naples). Thanks for posting these! There is a splash pad in Vernal (Naples) as well. Thanks for posting these!!! Hi - This is a great list! You may wish to note that the Daybreak pad is for card carrying Daybreak residents and their guests ONLY. We drove all the way out there from the Hogle Zoo area - to not be allowed to play. The kids left so sad ... Just so no one else is disappointed! I live in Daybreak and the splash pad at Soda Row is open to the public. They want as many visiters to Daybreak as possible. Sell those houses! There is a great gelato place and a bakery right next door. Great fun for the kiddos. You may have tried to get into a pool, which is for residents only. :( That is too bad! I knew the Daybreak Beach was only for those living their and their friends, but was not aware the splash pad was the same. :( That IS disappointing! We live near Daybreak, but not in Daybreak and we have never had a problem enjoying the splash pad or the beach. I have never seen a sign saying you have to be a resident either. The only thing I know I have seen a sign for is you have to be a resident to use a canoe or boat on the lake. Maybe you just went on a bad day when someone there was in a bad mood?? Kaysville recently opened a splash pad in Davis County. The address is approximately 200 N and Fairfield. Take the 2nd Kaysville exit, head east and look to the left after Main St. They now have one in Delta, in Millard county it's small but free. It's right next to the skate park. They're opening one at Pioneer Park in Provo next week. FYI, the one in Magna isn't free. It's included in admission to the pool. And thanks for the wonderful list. Hi, I'm not sure if this is a page you're still keeping up to date, but if so, I can get you pictures of the splash pads at Ellison Park and the one on Base. Just let me know if you're interested! That would be great! Please send them to enjoyutah@msn.com . Thanks! The Splash pad in Cottonwood Heights is actually called Mountview Park, not Mountain View. Not a big deal. just letting you know! Any new splash pads to update this list yet?